Méribel embodies the charm of an alpine village, with its wooden and stone chalets, scattered around the mountain. Whatever the winter sport, whatever the desire and whatever the level of service required, Méribel Vallée has a secret, its different villages: Méribel Les Allues, Méribel Village, Méribel Centre, Méribel Les Hauts, Méribel-Mottaret. 5 different neighbourhoods within the resort, each with its own identity, history, style, situation and atmosphere. 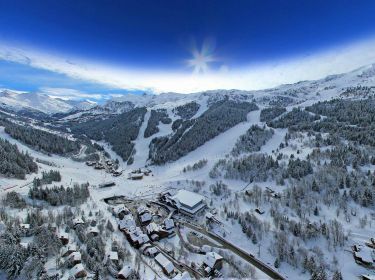 A range of choices that make Méribel Vallée such a unique destination. Here, all accommodation in ski-in, ski-out, from every part of the resort: Altiport, Belvédère, Rondpoint des pistes, la Chaudanne, Méribel Village, les Allues...this is how the resort's founders, architects and inhabitants wanted it, in order to make it a unique and very special place.